Beautiful Incentives: $1000 Beauty Collection Makeover Giveaway!! $1000 Beauty Collection Makeover Giveaway!! Attention Makeup lovers! One of my favorite blogs -Sparklecore- is having an awesome giveaway and there will be 3 winners lucky enough to win an entire beauty collection! Read on for more info and GOOD LUCK!! 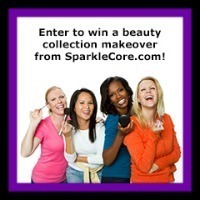 SparkleCore.com $1000 Beauty Collection Makeover Giveaway! To celebrate 20,000 Fans and our birthday SparkleCore is offering 3 lucky women the chance to completely revamp their Beauty collections! The grand prize winner will receive a huge prize pack worth over $1,000! That includes products from Mini Kittour, Mally Beauty, Prestige Cosmetics, Aveeno, Little Waisted, and more!The prizes are amazing, the entry is really easy, and the odds are great so join us for your chance to win a complete beauty kit makeover! It has been an amazing year here at SparkleCore! I’ve had a chance to get to know so many remarkable women through this site! It was always my goal to teach you what I know about cosmetics. It turns out that I’m the one who ended up learning about beauty from you all! Something I never expected to come from the site is all of the cool opportunities it has afforded me! I’ve been to so many amazing seminars, classes, and events this year! I have the industry to thank for that! I’ve been able to form relationships with some incredible brands and I’m so grateful to them for their support! I wanted to be able to give a little bit back to SparkleCore’s amazing fans! We will be giving one grand prize winner a complete makeover of her beauty collection! There will also be two runner ups who will receive mini-prize packages to get them started! So without further ado… The giveaway!!! The prizes will be listed right below the entry form. I enjoyed reading the article: Back to Basics: How To Use Color Correcting Concealer, it really sets the the stage in terms of what not to do and what to do when it comes to applying color concealer. I like Celebrities without makeup. It was quite funny when the article stated that celebrities always seem to have the glitz and glamour look but with paid stalkers, you can see what they really look like. Oh. My. God. The celebrities without makeup article was insane. Some of those pictures really boosted my own self esteem lol. OMG, the velebrities without makeup! Makes ME fell better! zoya sale! i love zoya!! I would love some new makeup! Back to basics, foundation finishes. Good, helpful info.